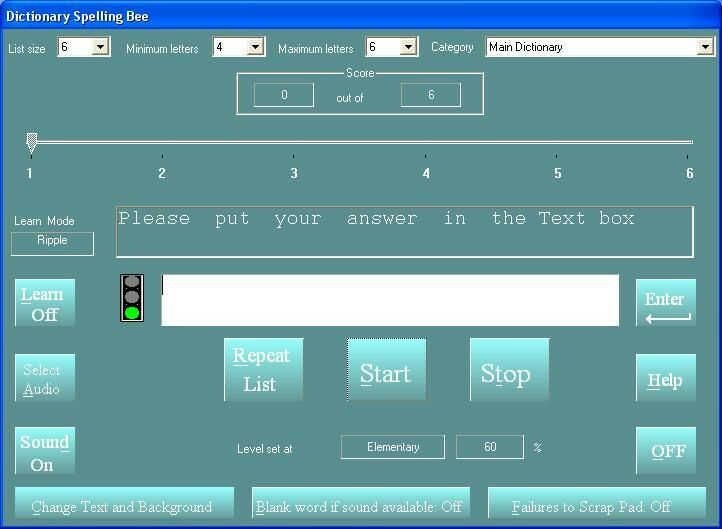 Dynamic Spelling Bee 3.1 is teaching & training tools software developed by Pajersoft. A serious multimedia spelling bee with powerful features aimed at students of all ages who want results. Multimedia features include high quality sound and a built-in recorder so linking sounds to words in the spelling dictionary is easy. The Spelling Bee can use either a 26,000+ word spelling dictionary, which can actually produce customized random lists or use standard spelling lists. This program is shareware, which means you can download and use Dynamic Spelling Bee 3.1 for free during 30-days trial period. After this period you gonna have to buy Dynamic Spelling Bee 3.1 software for $14.95 or uninstall the program. Dynamic Spelling Bee 3.1 supports different languages (including English). It works with Windows 98/XP/Vista. We have tested Dynamic Spelling Bee 3.1 for spyware and adware modules. The software is absolutely safe to install. Our website has thoroughly tested education product Dynamic Spelling Bee 3.1, written the review and uploaded installation file (5336K) to our fast server. Downloading Dynamic Spelling Bee 3.1 will take minute if you use fast ADSL connection. Make quick work of studying for and improve scores on spelling and definitions quizzes and tests by using FRS Spelling Challenger. Ten enjoyable games with an optional educational Spelling Bee. You need a spelling corrector to check the spelling of the words you use in your documents? You want to perform instantaneous spelling checking in Danish, Dutch, English, French, German, Italian, Japanese, Norwegian, Portuguese, Spanish, Swedish and many other languages? Then Spelling Corrector is what you need! Spelling Corrector allows you to check words spelling in several languages.